Eating clean and cutting out junk and highly processed food is hard, especially when you’ve been eating processed food for most of your life. Because old habits die hard, it’s really helpful to have some simple shortcuts to help simplify clean eating. These five clean eating hacks are my biggest tips to help you get started on your healthy eating journey. Shop the outside of the grocery store as much as possible. For the most part, the minimally processed foods tend to live along the edges and back of grocery stores. So, focus on doing most of your shopping along those edges to make it easier to avoid the processed foods in the middle of the store. Buy frozen fruit and veggies. This is my big exception to the first hack. Frozen fruits and veggies are frozen shortly after being harvested, which means their nutrients were locked in shortly after picking instead of deteriorating on their long trek to your grocery store. Added bonus: they stay a lot longer in your freezer than in your fridge. Pack your own snacks. For example, I buy almonds in bulk and split them into small snack-size proportions. And, having healthy snacks readily available means I’m not running to Starbucks for a cake pop. Looking to make clean eating easier? Try these 5 hacks! Plan your meals ahead of time. If you can’t decide what to eat, it’s often easier to grab something quick and processed instead of thinking up a meal and then preparing it. Lindsay from The Lean Green Bean has a lot of wonderful information on food prepping for the week that I’d highly recommend checking out. Connect with like-minded people. I love Instagram for this. I did a clean eating challenge back in April, and it was nice to have accountability and encouragement through social media. If you have friends near you who are healthy eaters, let them know about your goals and find encouragement through them. If you share your plans and have a good support system, you’re more likely to stick with it and follow through. Hungry for more great clean eating tips? Check out Sara’s kitchen hacks post. Or, read more about the things I learned during my clean eating challenge. 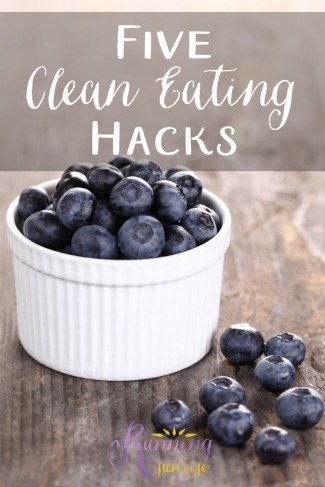 What are your clean eating hacks? I’m a huge fan of frozen veggies and frozen fruit! It definitely makes it easier to get a good amount of these things in during the week. I still need to get better on having healthy snacks handy though. I am, too! My freezer is stuffed with them after I hit the grocery store!